Social media marketing is both an art and a science. It’s always helpful to take some time to see what others are doing on Facebook, and also read about what big brands are doing and the lessons that can be learned from their efforts. A fantastic example is the 100th birthday campaign for Oreo cookies created by DraftFCB where they created a daily update for 100 days leading to Facebook interactions going up by 195%. Almost everyone likes to share his or her opinion. Surveys let you give your fans a voice and create engagement at the same time. Ask everything from “What’s your favorite color?” to “Whom will you vote for on election day?” As a bonus, when your fans share their preferences, you learn information that helps you create better targeted updates. 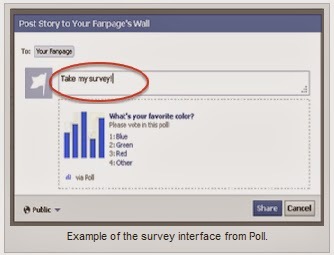 There are a number of easy-to-use third-party survey applications, including Polldaddy and Poll.